Inspired by the way bismuth crystals look. The return of the flagrantly China-friendly Mahinda Rajapaksa as Sri Lanka's premier has India scrambling to overhaul its diplomacy with the southern neighbor. At this point it is not clear how well New Delhi’s maneuvers will work to keep Rajapaksa favorably engaged since he is so deeply into China’s corner. It is no surprise that China's ambassador to Sri Lanka, Cheng Xueyuan, was among the first diplomats to meet Rajapaksa soon after he was elected prime minister last Friday in a startling move by Sri Lanka’s President Maithripala Sirisena. A deeply slighted incumbent Prime Minister Ranil Wickramsinghe, who was sacked by the president, has refused to recognize the change calling it illegal. It is a particularly awkward situation for India in its quest to maintain its influence over the strategically decisive neighbor because Wickramsinghe was known to be pro-New Delhi. India has no option but to work with Rajapaksa with as much enthusiasm if it wants to ensure that it gets a fair shake at becoming the dominant influence. Beijing kept Rajapaksa in great humor during his presidency between 2005 and 2015. The signature project that firmed up the Beijing-Rajapaksa relationship was the $1.5 billion deep water port and an airport in his political constituency of Hambantota in southern Sri Lanka. The port sitting on the strategically important Indian Ocean under China’s control is a matter of great concern for India. India has a history of having handled Sri Lanka in a cavalier fashion, not fully recognizing its strategic importance in the decades to come. It is only after China began coveting its natural assets that India began to see merit in them. China’s influence over Sri Lanka is considerable already and with the return of Rajapaksa it is expected to strengthen much to New Delhi’s anxiety. It is a simple fact that New Delhi has not been good at gauging Colombo’s aspirations. The most important stumbling block in China’s Sri Lanka policy is the growing perception that its predatory lending could seriously drive Colombo into a debt spiral and in the process undermine its sovereignty. It has been China’s policy across the globe to buy strategic influence by lending large sums of money to governments on terms that are deceptively favorable. It is possible that in the last two and half years that Rajapaksa was out of power he has recognized the dangers of unquestioned indebtedness to China and hence he might recalibrate his policies accordingly. It is in that possibility that India needs to make a pitch to him all over again. Of course, with the 2019 general elections looming over the Narendra Modi government it is not clear how much political capital it can spend over Rajapaksa in the next few months. China is not hamstrung by any such compulsions. Rajapaksa, like all ruthless politicians, will factor the Indian elections into his calculations before committing any new approach to the bilateral relations. That gives Beijing even more time to work out the kinks that may have set in during the Wickramsinghe tenure. India’s best hope is to keep its relations with Sri Lanka above the political fray and instead work its profoundly deep cultural ties dating back to over 2000 years because of the Buddhist exchanges. This should be done in concert with a long-term economic engagement. I think I have found one significant reason behind my middling, mediocre existence on the margins of relevance. I am just not invested enough in life. When you exude disinterest, disinterest is what you get in return. My most frequently used expression to my mother in my childhood was “Ma, maney bahu kantalo aave chhe.” (Ma, I am very bored.) It was not just being bored with a particular circumstance but being fundamentally bored. “Kantalo” came before I came to know of ennui. It was no surprise that when I heard Pakistani poet Munir Niazi’s line, “Aadat hi bana li hai tumne to Munir apni, Jis sheher mein bhi rehna uktaye huey rehna.” (You have made a habit of it Munir, To live fed up wherever you live.) When I first heard that line in a ghazal sung by Ghulam Ali ‘Bechain bahut phirna” ironically my face lit up because here was someone who had captured ennui so effectively. It might seem counterintuitive that even as I feverishly write prose, poetry and paint everyday, I still profess fundamental listlessness. You have to be in this state to know that you can be listless and still remain enlisted by life. It is a weird dynamic that one balances all the time. The simple fact remains that I am not fully invested in life, to the extent that would make me relevant. Let me give a trivial example which I face with disturbing regularity these days. I say disturbing because it has a direct impact on my livelihood. As a journalist, it is necessary that I manage to create access to those who are in the news in order for me to report. While persistence is essential in journalism, as you add up years, experience and reputation you tend to think that merely because you have reached out to someone for an interview that person would, at the very least, have the decency to say no. It is as low a benchmark as one can possibly have—a response, even an auto generated one, saying no. The problem is I do not get even that these days from anyone. So far there has been no response and if recent history of my interview requests is any guide, there won’t be any. Several factors go into celebrities and their handlers deciding to speak to the media, the standing and reach of the particular media outlet being one of them. There is also the question of how well-known the journalist seeking it is. If Anderson Cooper or Freed Zakaria had tweeted Minhaj, he and/or his press handlers would have rushed to say yes. It is not just the CNN as a massively influential global platform but even the individual celebrity/relevance of the two journalists that also becomes a factor. That’s what I mean by leading a middling, mediocre existence on the margins of relevance. That a young comedian of Indian origin would not find a request for an interview from me for a wire service read by tens of millions of people everyday even worthy of being formally rejected illustrates that point. Minhaj is only the latest example in a series. It is no reflection on him but entirely on my standing as a journalist. If I were invested enough in life, I may have done something about changing the state of affairs. As someone who obsesses with colors on a practically continual basis every day let me make some observations about black and white compositions. I do so because people are easily impressed with black and white photos or movies these days. It is just a simple fact that almost any photograph or movie can look better in black and white. That has to do with the fact that human brain processes less details better than more details. In black and white, definitions of what the brain is processing are restricted to just two. It concentrates much better. Let me illustrate it here. 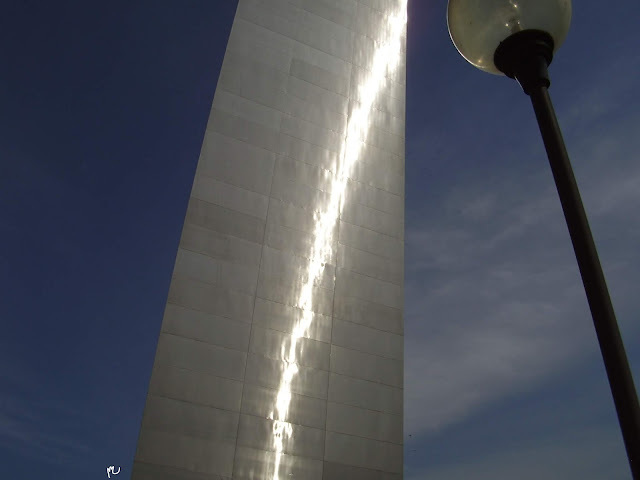 Consider the color photograph that I took of the famous Gateway Arch of St. Louis, Missouri, some years ago. The color photograph is lovely enough and its framing unusual. It is minimalist. Now consider the same picture that I turned into black and white below. It suddenly acquires an artistic edge. It appears more sophisticated although I must say the color looks pretty close to being as good. 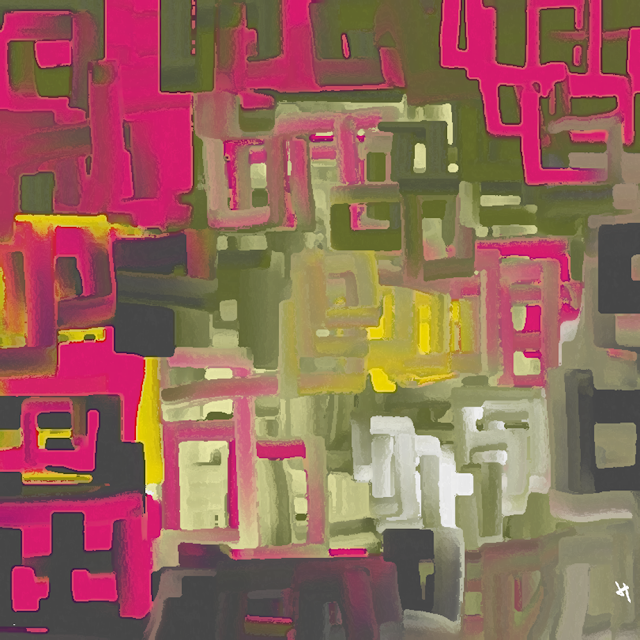 That is because in this particular case there are not too many color details for the brain to process to begin with. Let me give a more compelling comparison. Take this photograph of a staircase from a home we once owned. The color version is interesting. It does want to make you look at least once. And then compare it with the black and white version. The light in the black and white feels so much sharper because it filters out details, making it easy for the brain to process. There is no particular point to or provocation for this post other than observing that in the age of an explosion of personal photography with very high resolution camera phones there is an unprecedented increase in visual chronicling of life. More often than not it is not the skills of the photographer but the quality of the high resolution cameras that do the trick unintentionally. And if you choose to use a mercury or vanilla filter almost any picture can gain considerable allure. A detail to bear in mind is that in older times, the film roll itself could not process colors. The film used to be intrinsically black and white. These days, quite apart from the fact that amateur photography is predominantly digital, it is also mostly color that is converted into black and white as an effect. A photograph shot as a color picture and then converted into black and white produces even better black and white because it has captured light differently. Add to that, all the wonderful filters that camera phones have now. My point is don’t be fooled by that result to think that suddenly the world abounds in great photographers. Oftentimes, there is no input from the photographer other than just pressing a button and fortuitously capturing something visually powerful. Did you know large diffeos in stringy examples? Science at the highest levels of discourse is by its very nature an exclusive gated community where the swinish multitude is held back at the entrance. To be precise, there is no one really stopping you from entering this gated community except your own intellectual inadequacies. Most people—I would say more than 99 percent of the human race—do not understand science at its highest levels. Dr. Stephen Hawking, who died in March this year, spent his entire career practicing science at that level. With great trepidation I began reading his last paper titled “Black hole entropy and soft hair” written jointly with Sacha Haco, Malcolm J. Perry and Andrew Strominger. Black holes are objects where physics as we know it—quantum field theory and general relativity—gets torn asunder. According to quantum theory, information about a particle such as its spin and mass can never be erased from the universe. Hawking said that such information would be deleted in black holes but through radiation known as Hawking radiation information would leak. The only catch is that the leaked information would be unrecognizably different from its original properties. It may bear absolutely no resemblance to its original avatar. In a sense, the past will be totally reconfigured. That’s what I understand of that and I could be completely wrong. However, when you read the last paper written in 1975, you immediately know why high science is necessarily exclusivist and exclusionary. Read just these two random passages early on and tell me if they make any sense to you. It is just nominally English. Otherwise it is just pure science. “Many supersymmetric or near-supersymmetric black holes in string theory admit a Vir L ⊗ Vir R action of nontrivial or ‘large’ diffeomorphisms [1, 2] (henceforth large diffeos) whose central charge can be determined by the analysis of Brown and Henneaux . This fact, along with a few modest assumptions, allow one to determine the microscopic entropy of the black hole and reproduce  the macroscopic area law  without reliance on stringy microphysics. At some level I resent the fact that I have no clue what this means. I mean, did you know that the large diffeos in stringy examples are not ordinarily taken to act on the entire asymptotically flat spacetime? I certainly did not because I don’t know what “large diffeos” are? I have always believed that not everything in the universe is meant to be understood by everyone; for that matter not everything in the universe must be or can be understood. The universe is not democratic in the way we understand democratic. It has no obligation to be comprehensible to you and I. Like I said yesterday, a vast majority of us live out our lives mostly in the comfort of the familiar and not the comprehensible. Not knowing what “large diffeos” is neither here nor there for the vast majority of the human race. Knowing what they are is not going to pay your bills. However, that does not mean that preternaturally gifted minds such as Dr. Hawking’s should not concern themselves with questions of such improbable intellectual exaltation. People confuse familiar with comprehensible. As a great anonymous philosopher of our time once wrote, “With time, the universe becomes familiar but not comprehensible.” That anonymous philosopher would be me. I said that on August 9 this year in a piece about the (really) great quantum physics pioneer Paul Dirac. This confusion between the familiar and the comprehensible runs in all aspects of our lives. For me, all human relationships, including with my children, are familiar but not comprehensible. We live our entire lifespan not comprehending much of it but are comforted by the familiarity of it. Over time I have become familiar with things in life without really fully understanding them or even at all. Take a trivial example such as the computer I am working on right now. I am very familiar with it but my comprehension of why and how it works through the complex circuitry of its circuit board is wholly lost on me. I have tried to understand it but without much success. You would be amazed how many things we humans do in our lifetimes without really comprehending them. I would say a vast majority. I was looking at the full moon a couple of nights ago and moved yet again by its familiarity. However, I did not understand its shape, its construction, its movement or, most importantly, its raison d'être. We get accustomed to our universe. I cannot emphasize enough the fact that familiarity is not comprehension. In my personal case, there are so many instances everyday when just as I think I have comprehended something it begins to fall apart and coalesces into familiar. The occasions when I say in a single day “I just don’t get it” have increased dramatically with age. Given that the only option for the remainder of my life, such as it may be, I have to be content with being familiar with things rather than really comprehending them. That goes as much for quantum physics as for my personal human relationships. I just don’t understand anything. Familiarity does not breed comprehension. 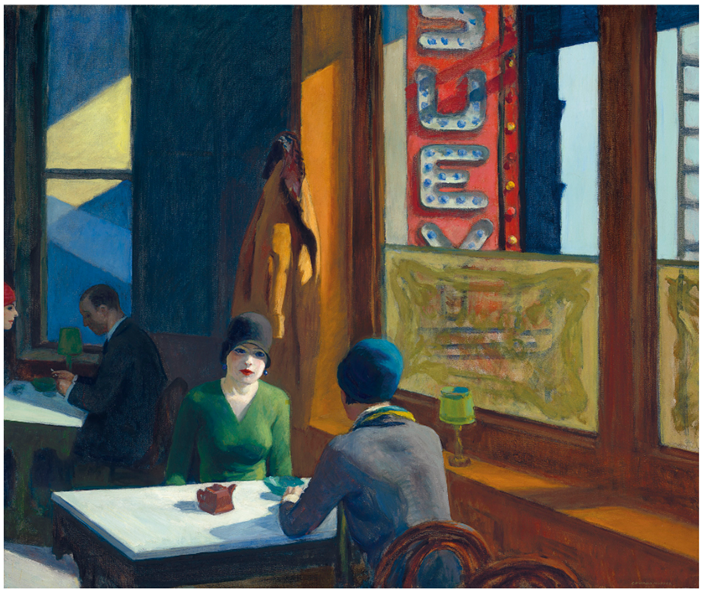 One auction I am looking forward to with excitement is that of one of Edward Hopper’s most iconic paintings, ‘Chop Suey’(1929), going under the hammer at Christie’s on November 13. It is estimated to sell between $70 and $100 million. 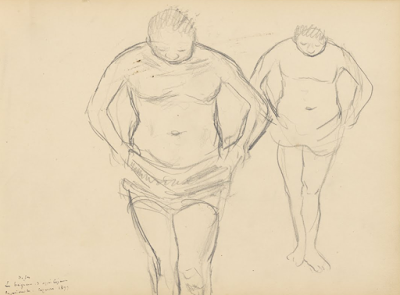 Hopper was the most cinematic of all American painters who had a special passion for cinema. Filmmakers return that love by creating many frames based on his paintings. I suggest you watch this short Christie’s video. It is remarkable that even though Hopper used an extraordinary burst of colors in many of his paintings, they all had that distinctive stillness about them. People in those paintings, like the one here, appear to have taken a break from the frenzies of their lives in these works. I have sliced up Chop Suey to illustrate that point as well as its characteristically cinematic quality. 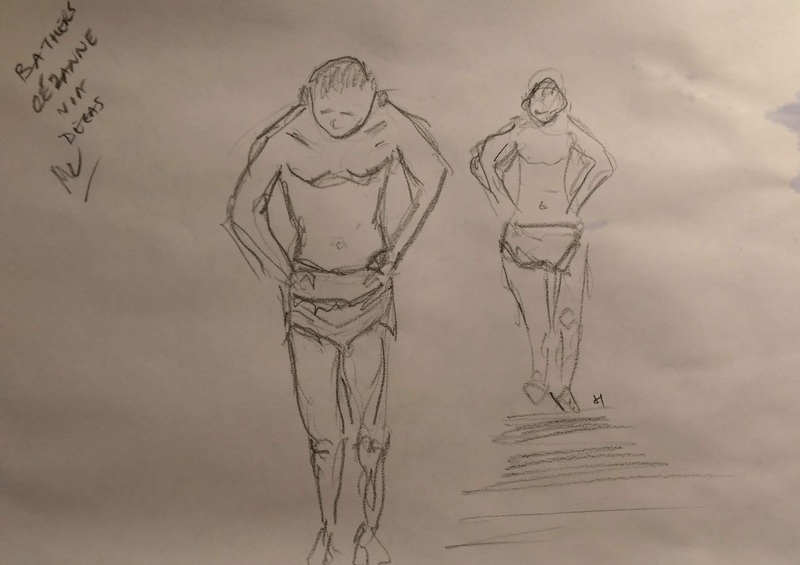 As an exercise, I do frequently do pencil sketches of famous works. 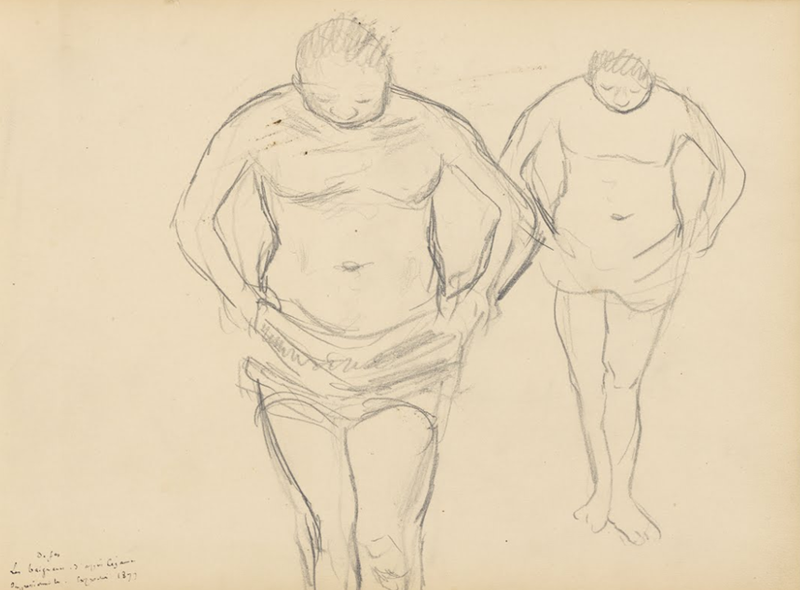 Yesterday while looking at Edgar Degas’ 1877 sketches of Cezanne's 'Bathers'. I felt prompted to do my version. So I did. That should be enough for the day. 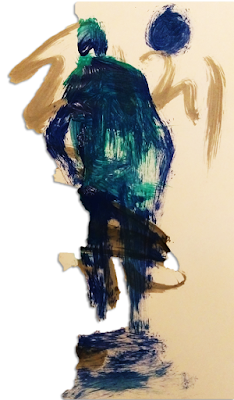 Inspired by Edgar Degas’ much celebrated 1881 sculpture titled Little Dancer Aged Fourteen I did this quick version yesterday. It has since grown on me, especially when I speculate in my own mind what the girl might be thinking looking at something undefined. I don’t know what Degas’ model was looking at but in my case I have kept it deliberately undefined. It looks like a curtain but then it could just be a combination dark void and light. This took me about ten minutes to finish using pencil and pastels on paper. I then subjected a photograph of it to some digital contrasting. I am currently working on turning the original work on paper to something close to the version above. In a sense, the girl sums up my state of mind these days. Rovelli is a well-known theoretical physicist whose work I am somewhat familiar with because as a non-physicist many of my lifelong obsessions have been the same as his. The idea of time and now has been one of the themes I have thought about for a long time. In this particular video, dated June 13, 2018, Rovelli discusses at length the idea of time and what now means. As I began to play it, I was instantly reminded of a piece I had written on October 29, 2013. That piece incorporated another one I had written in February of the same year. With the discovery of what is believed to be the most distant and therefore the youngest galaxy to be detected yet, it is time for me to again refresh you about the absurdity of our idea of “Now.” There is no now and not just because now constantly becomes then. It is also because of the sheer scale of the universe that “Now” is a futile idea. It may work terrestrially within earthly proximities but it begins to lose its meaning rather quickly even within our own planetary neighborhood. Astronomers have just announced that they have found the galaxy that was formed a mere 700 million years after the Big Bang. Called z8_GND_5296, the galaxy brings us our closest to the birth of the universe. When you consider that the age of the universe is determined to be 13.8 billion years, we are talking about its infancy. It has taken light from this particular galaxy 13.1 billion years to reach. So what we are seeing now is 13.1 billion years old. That’s what I mean the futility of now. What is extraordinary about this galaxy is that despite its very early formation in the aftermath of the universe it had a high star-formation rate. This was an unexpected finding. The rate was a factor of 100 greater than what we see in our own Milky Way.I think this is enough geektalk. Now on to esoteric talk. Does it strike you that everything in the universe is always communicating through its past and never its present? All phenomena that we experience are dated. There is no real real time contact among objects considering that the time lag between any two object is considerable. 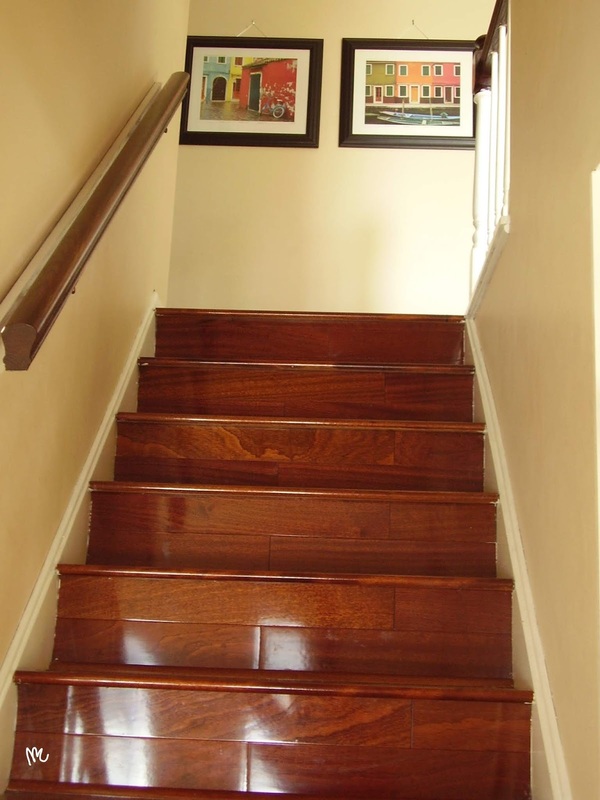 Take for example, an object so predominant in our daily experience as the Sun. Considering that light from the Sun takes eight minutes to reach us here on the Earth, it means it is already dated information even if it so by just eight minutes. As you begin to look beyond the interplanetary and into the intergalactic the distances become so vast that they no longer make sense on the human scale. If you don’t believe me check this out. At its closest the Venus is about 40 million kilometers from the Earth. Because of the elliptical orbits of the planets interplanetary distances vary extraordinarily. For instance, at its farthest the Venus is 261 million kilometers.Other than saying that it is extremely far, we cannot really sensibly comprehend how far. Now consider Proxima Centauri, the star nearest to us. It is 40 trillion kilometers from us. To give you some measure of how far that is 40 trillion kilometers is 40 million million kilometers. Not that we can realistically grasp that either. So the nearest planet and the nearest star are separated from us by an incomprehensible magnitude. It takes light, therefore information and data, 4.24 years to reach us from Proxima Centauri. That would be light traveling for over four years at the speed of 300,000 kilometers a second to arrive here. In other words, the information reaching us is nearly four and a quarter years old, even from the nearest star. Therefore, what we are looking at is Proxima Centauri as it was that long ago. If we want to know whether in the interregnum it got married, divorced, underwent a tummy tuck, won an Oscar, or simply turned into a red dwarf we have to wait nearly four and quarter years. What this means is that we are forever trapped in our universe’s past exchanging stale information. One way to get around this problem of enormous datedness is to collectively agree that our past is in fact jointly our present and our present will be our joint future. I use our in a cosmic and not an earthly sense. All that we can do is together decide that the present is when we see it and not when it might have actually happened in relation to a particular event or an object. Of course, we can also resign to the fact that there is no real present but perpetual past and there is no real future but nascent present. Moments are taking birth and perishing all the time. Our immediate anthropic present will never reconcile or converge with that of even our nearest planetary neighbor, the moon because of the time lag, albeit miniscule in this particular case. For all practical purposes it does not really matter that we are never up-to-date about the universe because we have to live with what appears before us. If Proxima Centauri was atomized at this present Earth moment, what material difference would it make to us in the way we process that information four and a quarter years into the future? For you and I Proxima Centauri will appear to have disintegrated only in June of 2017. It will be real present for us when we experience it then even though for the star it would be its past. There are two kinds of present, one that is real present as experienced by the object in question and the other as experienced by those away from it. This time lag exists even on our own planet but it is so small that as human we cannot perceive it. One way to respond to the post today is to ask me if I forgot to take my medicine. The more mature way would be to ponder yourself. It is not my intention to freak you out but to merely remind you that the concept of past, present and future is so strange at the scale of the universe. Perhaps the idea of a multiverse is supposed to mean that every object in the universe is a multiverse in and of itself in so much as their timelines never really converge. When it comes to anyone other than oneself, we can all only hope for the bare minimum timeline convergence.Friendships and romances develop during that timeline convergence. Is it any wonder then that only you genuinely know and converge with yourself? This is what Oscar Wilde called a lifelong romance.